The Bill & Melinda Gates Foundation is dedicated to bringing innovations in health and learning to the global community. 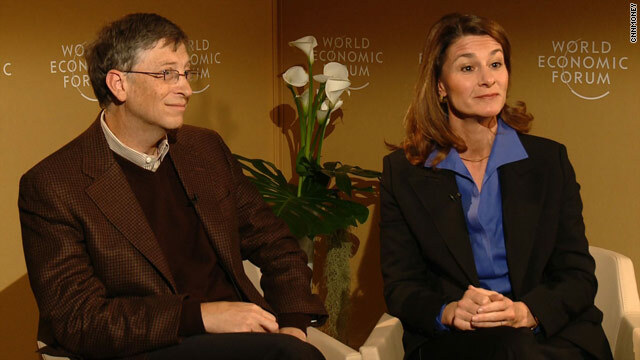 Davos, Switzerland (CNN) -- Bill and Melinda Gates announced plans Friday to invest $10 billion in the fight against a number of illnesses including AIDS and said the record donation could save nearly nine million lives. Speaking at the World Economic Forum in Davos, Switzerland, they said the 10-year program will focus on vaccines for AIDS, tuberculosis, rota virus and pneumonia. "We must make this the decade of vaccines," said Bill Gates. "Vaccines are a miracle," added Melinda Gates. "With just a few doses, they can prevent deadly diseases for a lifetime. We've made vaccines our priority at the Gates Foundation because we've seen firsthand their incredible impact on children's lives." Since stepping down as chief executive officer of Microsoft in mid-2008, Bill Gates has devoted most of his time to the Bill and Melinda Gates Foundation, a philanthropic organization he set up with his wife Melinda. He remains part-time chairman of the software giant. The foundation directs most of its attention to global health, education and agriculture in the third world and has committed more than $21 billion since it was established in 1994. The $10 billion commitment is the largest pledge ever made by a charitable foundation to a single cause, according to The Chronicle of Philanthropy, a newspaper covering nonprofit organizations. The couple told delegates at Davos that they used a model developed by a consortium at the Johns Hopkins Bloomberg School of Public Health in the United States to project the potential impact of vaccines on childhood deaths over the next decade. "By significantly scaling up the delivery of life-saving vaccines in developing countries to 90 percent coverage -- including new vaccines to prevent severe diarrhea and pneumonia -- the model suggests that we could prevent the deaths of some 7.6 million children under 5 from 2010-2019." The foundation also estimates that an additional 1.1 million children could be saved with the rapid introduction of a malaria vaccine beginning in 2014, bringing the total number of potential lives saved to 8.7 million. The couple said their pledge was inspired by the remarkable progress made on vaccines in recent years. But in an interview with CNNMoney.com, Bill Gates warned the foundation could not achieve its goals alone. "We're spending lots of money on vaccines but this won't cover everything. We need governments around to come on board. "It's one of the most effective ways health in the developing world can be improved." The couple also endorsed comments made Thursday by former U.S. President Bill Clinton that earthquake-hit Haiti has an opportunity to reinvent itself and achieve lasting change. "The goal should not be to get Haiti to where it was before," said Bill Gates. "It was in an awful situation. "They're going to need a lot of investment and not just in the next six months. It's going to take years, whether it's the reforestation sector or agriculture. "So I hope we can retain the attention there." The couple recalled their experiences in the impoverished Caribbean nation over the years and what they saw there, specifically the distress in its education system. "We've been into classrooms where there was 80 students in one class," said Melinda Gates. And with the subject of excesses in the financial sector high on the agenda at Davos, Bill Gates suggested bankers with their big bonuses should travel to places such as Africa and see what is needed for themselves.